This three week course will cover all the basics to give you a good foundation of which to build your own climbing. Weeks 1 and 2 are undertaken in Boulder Zoo, a quieter area of the centre. In week 1 we look at why using are feet properly is important, using traverse drills we practice good footwork. In week 2 we explore holds, what kinds of hold there are and how to use them. Rotating them and investigating how different holds in different positions are best used. Week 3 is using what was covered in the first 2 weeks on problems in the main centre. As we climb problems around the centre we talk about different holds, techniques and tactics. 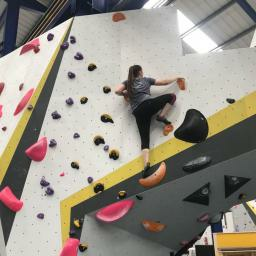 Session bulk: Using drills/tools to alter holds orientation and trying moves, seeing how the use of the hold changes in different orientations. Grouping participants together to create small sequences of climbing and then moving the hold and exploring how the sequence changes. Session bulk: Climbing a range of problems together at different areas of the centre. During the session we look at different movement skills and how they are used on a problem. Along with naming holds and paying attention to footwork this session brings the previous 2 weeks together into practice. Hopefully pushing the climber into the next ‘colour’. Spaces are limited to 8 for this three week course. Booking in advance is necessary.